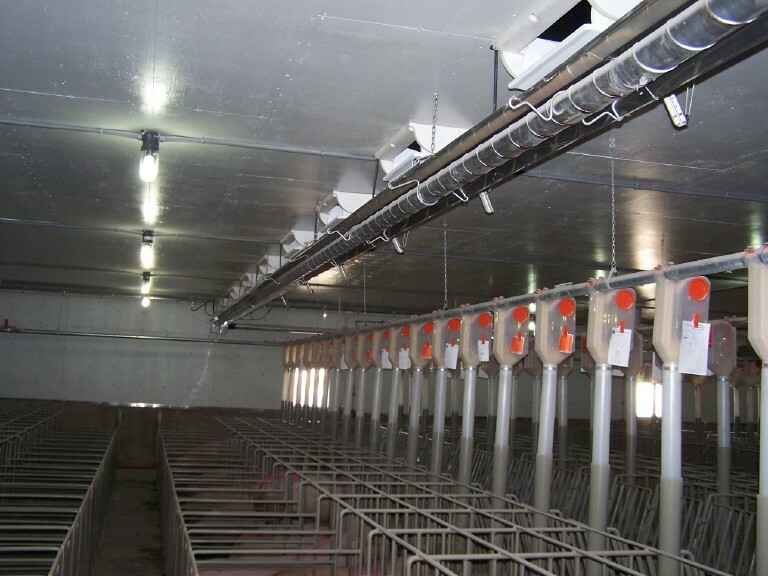 This Iowa hog confinement is heated with a Reflect-O-Ray 3.5 EDS vacuum infrared radiant heating system. Our patented insul-tubes are used for the reduced overhead clearance and provide a smooth even heat distribution. Stainless steel burner heads and exhausters are standard in most hog barn installations! Minnesota, Iowa or Nebraska winters can be cold, but the inside of this confinement, the floor temperature is kept constant by the 3.5 EDS Reflect-O-Ray heating system. This confinement building has the infrared heaters in hallway, therefore stainless steel burners are not necessary. Putting a Reflect-O-Ray infra-red tube heating system in your barn, is like putting money in your pocket! System placement is key to a healthier, dryer pig.